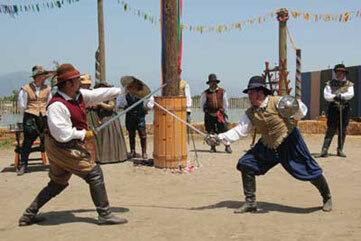 The Gentlemen Adventurers specialize in swordplay demonstrations in the Elizabethan time period. 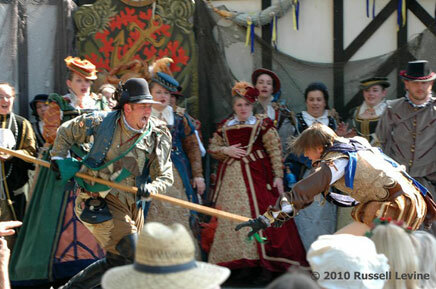 We provide demonstrations in fighting using the rapier, long sword, buckler, quarterstaff, dagger and broadsword. Our shows focus primarly "a tiempo" combat (meaning "in time"). These fights are done at lower than full speed and with members that know each others timings and capabilities. This is extremely important because while we do have some routines that have choreography the vast majority of our fights are not choregraphed. As you'll notice from our images we're also not using any specialized equipment (facemasks etc). We train year round to ensure that we can do this safely.